Out of Forbes 400 Richest People in America, 32 are owners of professional sports teams. The list includes owners of 14 NFL teams, 14 NBA teams, 4 NHL teams and 2 MLB teams – some owners own multiple teams. The richest sports team owner is Paul Allen, who owns both the Portland Trailblazers and the Seattle Seahawks. As co-founder of Microsoft, Allen is the 26th richest American and is worth $15.8 billion. 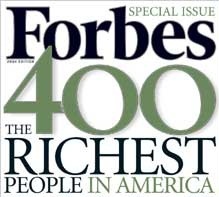 For a complete list of Forbes 400 Richest People in America, please click here.